Rafting in the Smoky Mountains - Bear Camp Cabin Rentals. When you close your eyes and imagine your Smoky Mountain vacation, what do you see as the most thrilling part of it inside the mountains surrounded by forestry itself? Is it climbing to the top of Rainbow Falls and gazing at the famous Gatlinburg landmark? Is it seeing (or fleeing) from the wildlife that co-exists with us? Is it the miles and miles of God’s own wonder stretched out before you as you get to the top and know that over 90% of the world is below you? Or is the chance to get down from the top and ride nature’s own rollercoaster across a turbulent patch of the Little Pigeon River with a group of friends as you gleefully scream and cheer at the same time? To each man and woman their own, but surely on some level, we can all agree the last item on that list provides the most natural thrills you can get inside the park itself, yes? Then what’re you waiting for? You and your family or group should plan on going White Water Rafting in the Smoky Mountains this season! 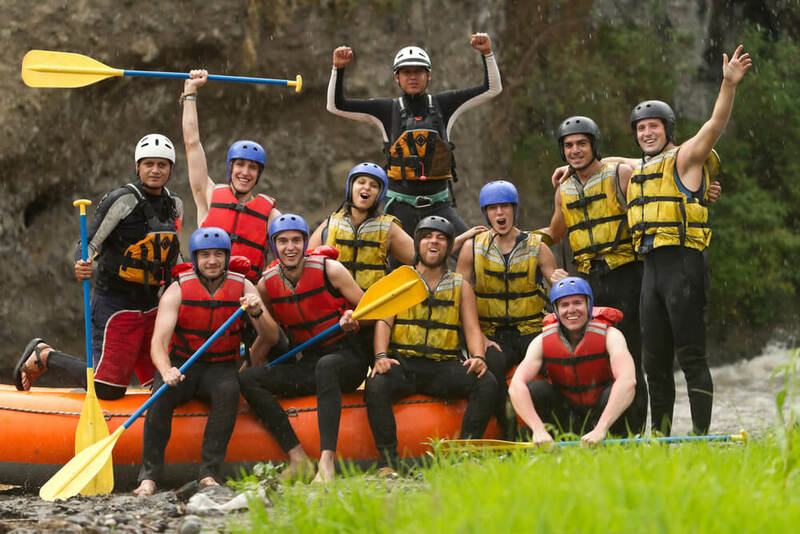 Whitewater rafting is where you and the aforementioned group take a raft with a qualified professional guide and paddle up, down and against the Rapids. The waters crash all around you and create a strong white fizz for a moment after colliding with you (hence the name) and while it is a tempestuous ride with a lot of wild movement, it is, in fact, safe for people of most ages. With all companies providing whitewater rafting in the area, you are given inspected safety gear and travel with an expert guide on each ride. Rides generally last about 1.5 to 2 hours depending on which rafting provider you go with and which section of the river you choose to go on. Most rafting companies have a minimum age of 8 years of age for children, but some may go as young as 3 years of age. Some companies may also provide transportation either as part of the package price or for an additional fee. – 6.5 miles in length. – Class 3 and 4 rapids (moderate and moderately heavy). – Roughly 70 rapids from the length of this section. – Scenery includes sections of the Great Smoky Mountains National Park and the Cherokee National Forest. – 5.5 miles in length. – Class 1 and 2 rapids (calm and moderately calm). – A low number of rapids – a good trip for younger children and adults that would prefer a more scenic river trip. – Scenery includes the Pigeon River Gorge and the Great Smoky Mountains National Park. Most of the whitewater rafting companies can be found in Gatlinburg or Hartford, TN, past Cosby. We’ll give you a starting list of great companies right here and save you some Googlin’ time. We hope that helps you start off your journey through the rushing waters of the Smoky Mountain rapids! Bring a family and/or some friends – it will be an experience you never forget!